Hiya! Happy Monday to you all! Some weather we're having, huh?!! Unless you are lucky enough to be living in CA or Arizona or someplace else where it's sunny and warm (and if you are, can I come and stay with you?) chances are you are currently shivering and cursing the very low-digit thermometer. And you're spending a lot of time inside. Wanting something warm and delicious and above all, comforting! But we're still trying to keep to our healthy eating plan for the new year, right? 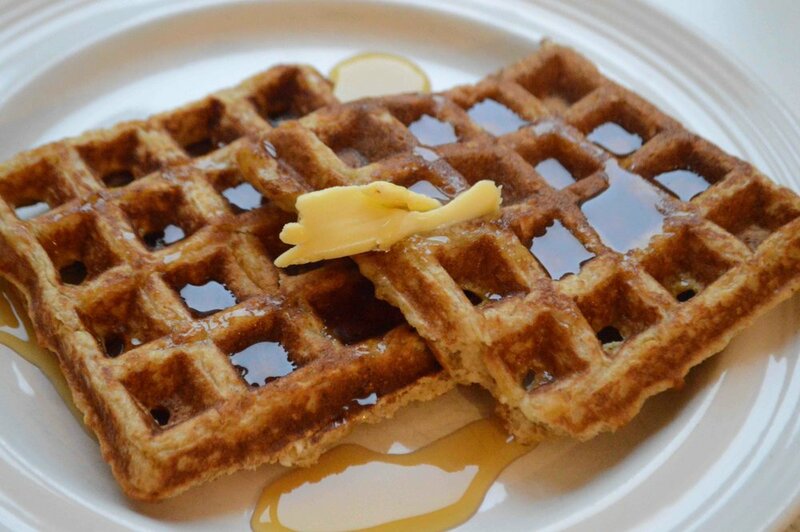 In light of all that, let me introduce these easy, light and healthier oatmeal waffles. Breakfast just got a lot more fun and nutritious! I am a big believer in breakfast. Not little chocolate doughnuts or sugared cereals, but some sort of protein/fiber/vitamin combination. I've always held to the theory that eating a good morning meal sets you out on the right path for the day and keeps you from nibbling on junk all day long and eating a big dinner that makes you feel heavy and sluggish the next day and doesn't leave you any time to burn off all those calories. Well, science has confirmed this mama's instincts. My oldest, who's in his first year of med school, recently told me that as the day goes on not only do we feel tired, but our cells and pancreases get tired too and stop working as efficiently as they do early in the day. Aww, imagine a tired out little pancreas! Anyway, even more reason to eat a good breakfast and these waffles. Have you ever used oat flour before? That's the basis for these waffles and what helps to make them so nutty and wholesome. You can buy it ready made but it's easy and much less costly to just process oats in a food processor. What I also love about these is their flexibility. If you want to keep them entirely dairy-free and vegan, you can swap in coconut oil and almond, rice, or soy milk for the butter and cow's milk. You can also mix the dry ingredients together beforehand and have that all ready to go so that all you've got to do is a bit of stirring and waffle ironing on busy mornings! The best part of course is the taste! Every bite is crispy and light with a hint of cinnamon. I like them without any topping at all, but among my crew that definitely is not the majority opinion. No matter what you use though, these won't weigh you down but will keep you fueled through these long, cold days. Move over Eggos!! Stay warm everyone!! 1. Whisk together the oat flour, baking powder, salt and cinnamon in a medium bowl and set aside. 2. In a separate small bowl, whisk together the mlk, butter, eggs and maple syrup. Pour the mixture into the dry ingredients and use a spoon to stir them together just until combined. The batter will still be lumpy. Let sit for 10 minutes to rest and allow oats to soak up the liquid. 3. Meanwhile, heat waffle iron on high. 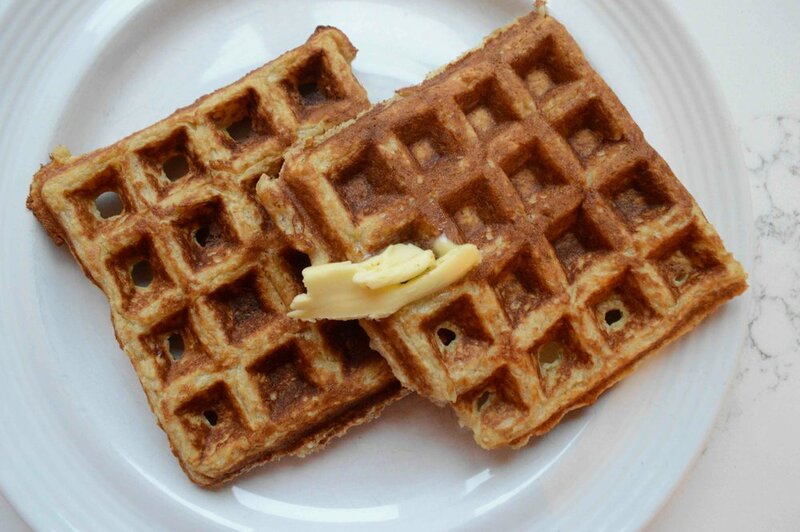 When batter is ready, give it another good stir and pour some batter onto waffle iron. Cook waffles until golden brown and crispy. Serve immediately with butter and maple syrup or jam. Note: Recipe adapted from Love Real Food by Katharyne Taylor. Waffles, at least homemade ones, are not something you generally indulge in during the regular week. Waffles are something special and out of the ordinary, something to be savored and enjoyed at leisure, not gobbled down before running out to work or school. Waffles are for weekends.